Broadway in Boston is back in business for the new season with a brand new touring production of Rodgers & Hammerstein's classic, "South Pacific." So brand new, in fact, that Boston is the first official engagement on its tour. This particular tour is based on the critically acclaimed Lincoln Center Theatre production that set New York on its ear in 2008. Directed by Barlettt Sher, the Lincoln Center production walked away with the Tony Award for direction and musical staging. Sarna Lapine directs the tour. The Lincoln Center Theatre production was also broadcast live, one night only, before the end of its run in August of 2010, as a part of PBS' "Live From Lincoln Center" series. Based on James Michener's Pulitzer Prize-winning Tales of the South Pacific, the show's music is by Richard Rodgers, with lyrics by Oscar Hammerstein II and a book by Oscar Hammerstein II and Joshua Logan. Ensign Nellie Forbush is a nurse at a naval base on a tropical island in World War II, yearning for something more. The naive nurse from Little Rock falls in love with dashing Emile De Becque, a French plantation owner who left his homeland long ago after killing a man. While he was running away from something; she is running to something. What she doesn't know is that Emile has two small children from his marriage to an island native, now dead. This fact will drive a powerful wedge in their relationship. The war with the Japanese rages on as we meet the sailors of the base, one of whom, Luther Billis (Christian Marriner), runs a side business to meet all needs from trinkets to personal laundry services. His nemesis in the tourist business is Bloody Mary, a Tonkinese native who hawks her pushcart of grass skirts and shrunken heads to Luther's dismay. Enter the boyishly good looking Lt. Joseph Cable, sent to help with the war effort and take part in a mysterious mission to spy on the Japanese from a nearby island. Not unlike Nellie, Cable will be forced to face his own racial prejudices when he falls in love while visiting the mysterious Bali Hai, an island off in the distance promising mystical experiences of love and ceremony. Nellie finds love, rejects it, and almost loses Emile before eventually embraces her new family. Lt. Cable struggles with his feelings and winds up making the ultimate sacrifice. And Luther accidentally helps the war effort while being a nuisance. For a show written in the late forties, it maintains its handle on the times, including the subplot of racism. The company is fine, if not particularly outstanding. As Emile, opera star Marcelo Guzzo sings with authority but is sometimes difficult to understand when he speaks. As Nellie, Katie Reid sings with a lovely voice, particularly in "Cockeyed Optimist" and "I'm In Love With A Wonderful Guy." Her first scene at Emile's home seemed a little flat, but she opened up a bit as the night went on. The couple did a thoughtful job on their "Twin Soliloquies." Shane Donovan (no relation) plays Lt. Cable. While he sings with a big voice, there's a difference between singing a number and truly performing it. And he hasn't quite gotten his hands around his character yet from the acting standpoint. No doubt that, too, will improve as performances continue. The bright spot of the company is Cathy Foy-Mahi as Bloody Mary. As the scrappy island native who curses those who get in her way, Foy-Mahi has it down pat. She sings with feeling, particularly in "Happy Talk" and has a couple of scenes that leave you in silence. The drawback, and totally not her doing, is the ghoulish make-up with which she's been saddled. It distracts greatly from the performance she's giving. For a touring production, this particular show has a very nice look. While some shows on tour cut corners to rely on ultra-cheap painted drops and cheesy flats (hello, "Young Frankenstein"), that's not the case here. The sets (Michael Yeargan designed the originals with additional sets and adaptation by Mikiko Suzuki MacAdams) are detailed and polished. Rolled screens are utilized to give the island effect. And the scenes in the navy offices employ an impressive series of full stage maps. Now, as always, the strength of the show lies in its score. And this one is filled with one standard after another speaking of love and longing and romance. "South Pacific" is from a time when the world's top ten hits were always found in Broadway shows. Those days are long past, but "South Pacific's" score lives on in glory, from "Some Enchanted Evening" and "I'm Gonna Wash That Man Right Outta My Hair" to "There Is Nothing Like A Dame," "Younger Than Springtime" and "This Nearly Was Mine," arguably one of the most heartbreaking ballads ever to grace the Broadway stage. On this level, "South Pacific" touches the heart as it always has, still beckoning "Come to me . . .Come to me." 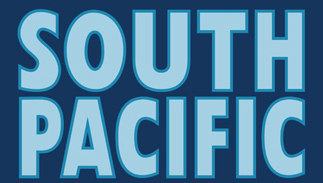 "South Pacific" is at The Opera House, 539 Washington Street, through October 2. 800-982-2787.